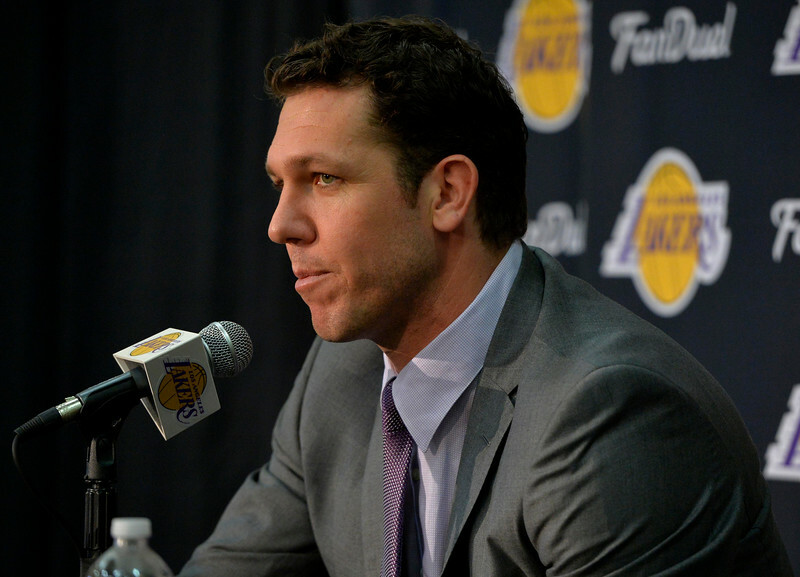 Lakers coach Luke Walton has already become acclimated with his new position just over one week into the job. Some clarity has emerged on Walton’s coaching staff, with the Lakers officially announcing Brian Shaw as an associate head coach and Jesse Mermuys as an assistant coach. The Lakers also announced Mark Madsen will be retained as an assistant coach. After winning three NBA championships with the Lakers (2000-2002), Shaw became part of the Lakers’ coaching staff under Frank Hamblen and Phil Jackson (2005-11). The Lakers chose Mike Brown over Shaw to for their vacant head-coaching spot following Jackson’s retirement in 2011. But after serving as associate head coach for Indiana (2011-13) and head coach with the Denver Nuggets (2013-15), Shaw returned to the Lakers and hopes to become a conduit between the team’s players and coaching staff. Mermuys, who graduated from Walton’s alma mater at the University of Arizona, had been assistant coach for two seasons under Toronto Coach Dwane Casey before overseeing the Raptors’ Development league affiliate. Mermuys will also be the head coach for the Lakers’ Summer League team, while Madsen and D-Fenders head coach Casey Owens will serve as assistants. Madsen had been on the Lakers’ player development coach under Mike D’Antoni (2013-14) and assistant under Byron Scott (2014-16) after having previous assistant coaching stops with the Utah Flash (2009-10) and Stanford (2012-13). The Lakers named him the D-Fenders’ head coach in the 2013 offseason before he quickly joined D’Antoni’s coaching staff. Madsen also spent part of his nine-year NBA career with the Lakers (2000-03) where he won two NBA championships.